Whether you run a warehouse, work in a retail store, or manufacture and distribute your own products, the issue of slow-moving inventory is a problem that can affect many different industries and product types. The fact of the matter is that some products just don’t move as quickly as others, and this can start becoming an issue for any facility or business that has an inventory it needs to rotate. Identify Your Slowest Items First: The first step in determining if you have a slow-moving inventory problem is to take a look at everything you’ve sold over the past 12 months or so. Have certain items only been popular for a certain span of time in that 12 months? Did some items see a spike and then drop right back down? See if any of your items have had a slower lifecycle or a shorter increase in popularity, and go from there. Figure Out Why It Isn’t Moving: This is going to be pretty subjective from item to item and industry to industry, but after you’ve identified your slowest moving items, you might want to dig into why. Is it being poorly advertised, or is there a lack of customer awareness that you offer this product? Did you order too many, or do you have higher amounts of these products than you did other faster-selling items? Or maybe it just isn’t a particularly popular item and only appeals to a small audience? Whatever the reasons are, there’s bound to be one – find out what it is and you can go from there. Take Steps To Get It Moving: Sure, the temptation might be to immediately mark down or write off slow moving inventory, but trying to get it sold will be a much healthier step for your profit margin and revenue stream. 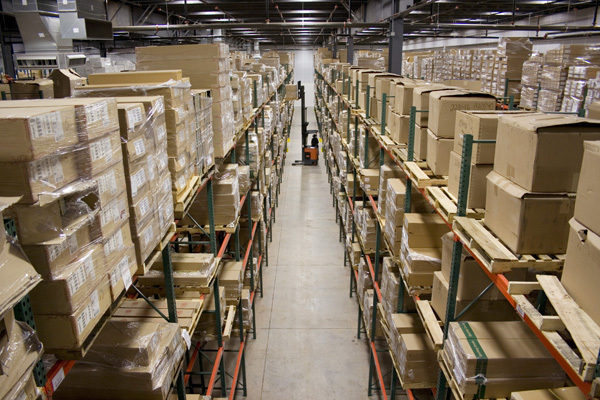 If your warehouse has a lot of overflow, get some new industrial storage and wire shelving to rearrange your slow inventory to better accommodate shipments and place slower items in a more easily-accessible place away from the items that move more quickly. If you run a physical storefront, consider placing these items on more prominent retail displays to draw customer’s eyes and advertise them more heavily. Do you do your sales primarily online? Consider offering these items as a promotion with other purchases, or mark them down heavily and work them into your typical product rotation to encourage sales. Prevent Slow Inventory Going Forward: When purchasing new items, or for re-ordering slower moving product in the future, there’s a number of factors you’ll want to consider to prevent the inventory from piling up again. Consider the costs involved with new or recurring inventory such as price per unit, shipping and handling costs, and product demand – pay careful attention to that last one, as it might dissuade you from stocking certain items to avoid running into this problem all over again.